Back in the 1970’s & 1980’s, the Arab boycott was in full swing and US companies such as Pepsi and McDonald’s could not be found in Israel; during the mandate, local Arabs boycotted Jewish business; today, some Arab states still reject any passport with an Israeli stamp and whilst UN hostility has mainly arisen from the Arab bloc or Warsaw Pact, if it wasn’t for the threat of the US veto, the UN, along with many European democracies would have long ago voted Israel as the primary cause of world hunger and disease. BDS is not new. 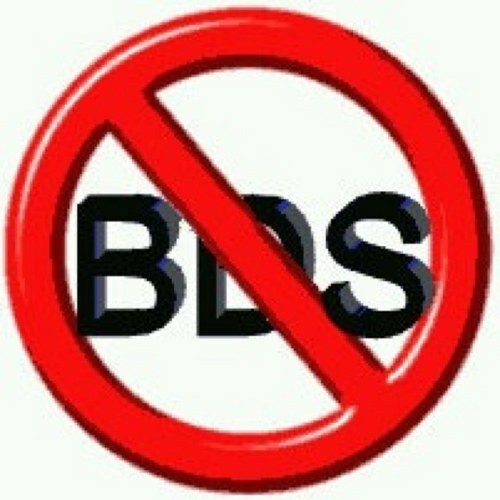 BDS: no dissent allowed. credit: The Mike Report. Antisemitism: No, not every one involved with BDS is an antisemite, but by the same token it is difficult to imagine an antisemite not aligning with the movement. Further, BDS plays on age old anti-Semitic stereo-types and imagery; creating a demonic version of Israel, one based on fears of Jewish power, Jewish cruelty and Jewish inhumanity and whether intentionally or unintentionally, people who identify with this ancient hatred, even subconsciously, find themselves ready and willing soldiers for the BDS cause. Numerical inferiority: Mainly because of the impact of the changing demographic, people actively opposing BDS are now heavily outnumbered by rabid BDS activists, willing to lie and spill their antisemitic venom on any ear within reach. The vast majority of students may be people sympathetic to Israel and culturally aligned with its western values, but these ‘BDS targets’ are far more likely to hear how wonderful and important BDS is, than what its real aims are. Previous Racism and the Palestinians. An excellently argued case for NOT fighting BDS on BDS’ terms. So often we hear on this site that the Palestinians are a “fake people” or that those who support BDS have this or that agenda, Or this or that aspect of BDS is invalid. We might also add to that the constant railing against those of Jewish or Israeli heritage, generally libertarians or humanists, who have bought some or all of the BDS rhetoric. This frankly is a waste of time in an increasingly cynical and libertarian society. This is what fighting BDS on BDS terms is really all about. The counter to BDS must be the recognition of Israel’s right to exist on its OWN terms. A state very much engaged with the world and a great global citizen. And that means we shout be requiring the peak body of Australian Universities to make the same declaration that the UK universities did. Why it is important for all Australian political parties to acknowledge the right of Israel to be the Jewish homeland. The inclusion of Israeli teams in sport. The right for Israel to be a model for innovation in industry and science. To contribute to the cultural life of global society. This is the advocacy we should be pursuing. This has nothing to do with BDS….this has everything to do with advocating Israels right to exist and the global benefits that accrue from that existance.